This series is for maths teachers who want to develop their maths teaching skills. This book is for teachers and educators who want to develop their maths teaching skills where English is the language of instruction. It has been written by the international group of educators based at AIMSSEC, The African Institute for Mathematical Sciences Schools Enrichment Centre. The book provides practical classroom activities underpinned by sound pedagogy and recent research findings. The activities are designed for teachers working alone or in ‘self-help’ teachers’ workshops. They are designed to develop mathematical thinking and offer immediate practical tools to help deliver this approach. All of the content in the book has been trialled by teachers around the world and is written by experienced maths teachers and subject matter experts, so you can be confident that the tools can be used to help deliver successful teaching and learning in your classroom, wherever you might be in the world. 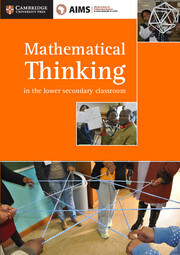 This book: provides practical support for mathematics teachers in the 11-15 lower secondary classroom, includes activities that exemplify ways of teaching and learning the most important parts of any national curriculum, and offer material that is universally relevant is written by an experienced international writing team, all of whom have worked as teacher educators in more than one country. Focuses on problem solving activities and identifying powerful ways of approaching the curriculum. Offers teachers ideas for introducing mathematical concepts through enquiry based learning draws on the activities on the NRICH website (www.nrich.maths.org) which has been built up over the last eighteen years. Linked to curriculum requirements, this title focuses on problem solving activities and identifying powerful ways of approaching the curriculum. It offers teachers ideas for introducing mathematical concepts through enquiry based learning rather than starting from facts and then using drill and practice. The rich tasks (activities) exemplify ways of teaching and learning the most important parts of any national curriculum, and offer material that is universally relevant in the teaching of mathematics. Each chapter of the book will provide a group of teachers with enough information to run a self-help workshop without the need for an expert to lead them, and will also provide ‘guided discovery’ learning activities for lessons and suggestions for teaching the topic. Includes ideas for 'Teacher Workshops' which describe a thought-provoking workshop session based on a particular mathematical topic and pedagogical theme, providing activities and explaining the underlying mathematics. Includes 'Classroom Activities' which are lessons based on activities which engage and motivate the pupils, and also develop and extend teaching styles.